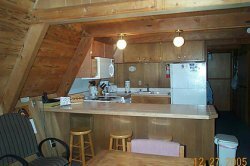 Welcome and enjoy our Tahoe Cabin as you walk into our sunny great room that combines the living room, dining room and a newly remodeled kitchen .The down stairs bedroom offers a Queen bed and bathroom as well as a Queen bed and bathroom upstairs. A separate room offers two twin beds. 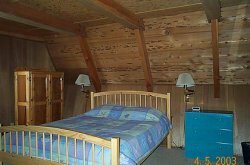 The loft has two twin beds, as well as a TV, VCR, DVD, and Nintendo for the kids. 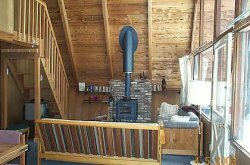 The large deck is a great gathering place for BBQ, playing poker at the table outside or maybe just relaxing and swinging in the hammock. Chamberlands Beach and Mountain Club is a private association where you have the privileges of using our private beach, pool and tennis courts. There is a free shuttle bus service from our front door to the beach where you will find daily activities for the children beginning at 1:30 p.m. Skiers will enjoy Homewood Mountain Resort which is just minutes from our front door and kids 10 and under ski free. 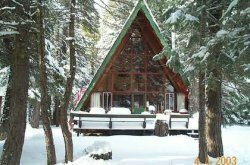 World renowned Squaw Valley and Alpine meadows is a short 20 minute drive. There is much to do in and around Homewood. We know you'll enjoy it as much as we do.